The calm and safe harbor attracted the Athenians in the 300s BC. The town was the site of a Greek encampment. Later, it became a fortified city-state called Leukolla. Although the modern town of Protaras has replaced Leukolla, the beach town in the peaceful setting has historic landmarks as well as a traditional, natural and laid-back seacoast culture. The local economy is mostly supported by its active tourist industry. However, the locals favor this town and beach for their own recreation. Additionally, they keep it clean and appealing for visitors. Climbing to Ayios Elias Church - A landmark, this historic church is on a hill. Visiting requires climbing about 300 steps, but the view from the rugged hill is incredible overlooking the coast and sea. An impressive structure, the interior has a lovely atmosphere that calms the soul. Hiking and Wildlife Watching at Cape Greco - A point of cliffs on the southern side of Famagusta Bay, Cape Greco is found in southeast Cyprus. The scenic area is a popular natural park reserve. People who want to get out in the wilds and enjoy the local peaceful coast and wildlife love to visit. The panoramic view of the ocean is worth bringing a camera. 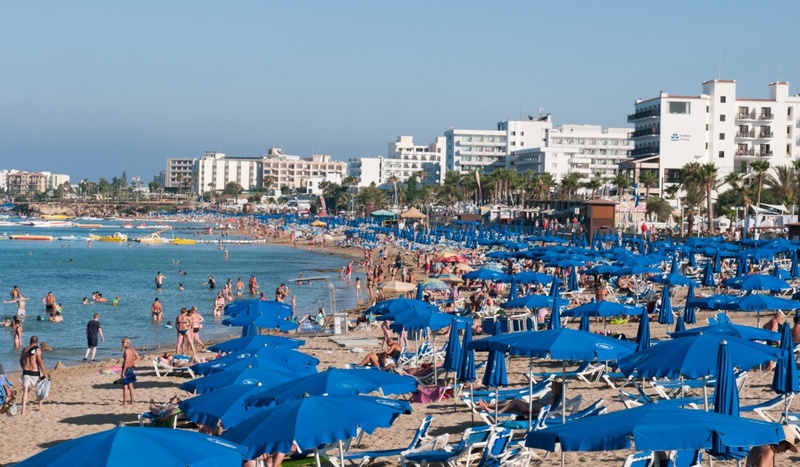 Beach Relaxation and Water Sports at Fig Tree Bay - In this stunning location, the waves are smooth and the water warm for swimming. People enjoy water sports like jet skiing, snorkeling and boating. Refreshments, open sand and cabanas are available on the beach. Other Activities for Visitors - A number of other activities are available for visitors to Protaras like touring the island and sea. Locals and people from all over the world mingle amicably in Protaras. In fact, most of the friendly shop, restaurant and hotel owners and personnel speak several languages. Find information about selected Hotels, apartments and rooms in Protaras to choose the perfect place for your accommodation.